PARTNER/ASPAN enjoys a world-wide reputation as the easiest-to-use software with a user-friendly interface for programming woodworking machinery. Furthermore, the program is very powerful with a hundred high-level commands, functions and options. Originally created in DOS in 1992, the program has been continuously updated to keep pace with the new operating systems. Performance has been developed and improved with the continuous addition of new commands and functions. We are proud to say that any of the problems experienced by our customers over the years have been solved by our internal troubleshooting SERVICE (service-disk). We reproduce and solve errors here at ATool Software without the need to intervene at customer sites. 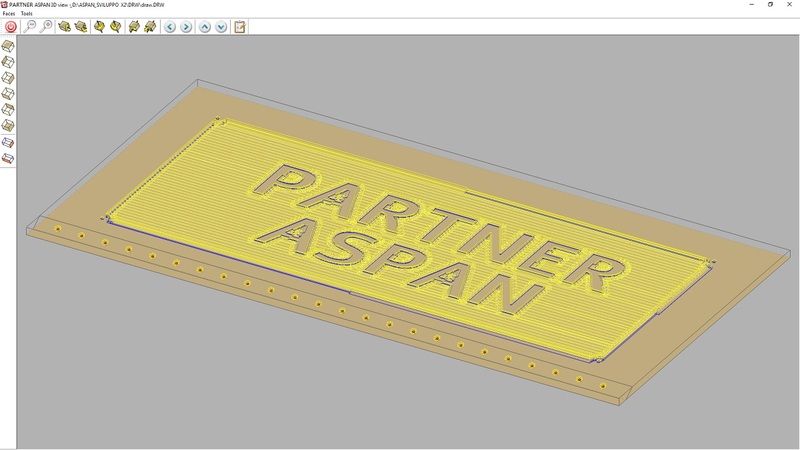 PARTNER/ASPAN is an integrated CAD-CAM program. Users draw their production parts quickly and easily in the CAD environment and then transfer these to the CAM environment to prepare the optimized machine programs needed to actually produce the part. A set of easy to understand commands (e.g. “Draw Holes”, “Draw Grooves”) and automatic routines (e.g. “Assign tools”, “Optimize machining sequence”) make it easy for users to define the machining operations to be performed on the unfinished parts. The main or Supervisor environment, which appears after the program has started, displays the preview image of the current drawing, on the right, and the list of the current archive along with search and selection options. If the drawing has been processed in the CAM environment, machine efficiency is displayed at the top right of the screen (ratio between empty shifts and real operations). From the Supervisor Environment it is possible to carry out import or edit procedures for machine configuration and tooling and to run all other program environments. This is the drawing environment used to create graphic entities such as various types of hole (e.g. standard, countersunk, in lines, angled, hole barriers, ect.) and routings (e.g. straight grooves, arcs, ellipses, rectangles, points, , ect.). Standard commands (e.g. “Join”, “Rotate”, “Auto-join”) and advanced functions (e.g. “Text”,“Empty area”, “Inclined surfaces”) are used to create the desired drawings. This is the environment where drawings are converted into machine programs by using a series of utilities for operations such as automatically assigning tools and optimizing machining sequences. A series of special commands (e.g. “Inputs/Outputs”, “Multi-machining”) makes it possible to configure the machine program with the exact specifications (e.g. tools, speed, worktable) of the machine currently being used. In addition to being a very easy-to-use and quick program PARTNER/ASPAN provides the most advanced user with an efficient internal language, APL (ATool Software Programming Language). 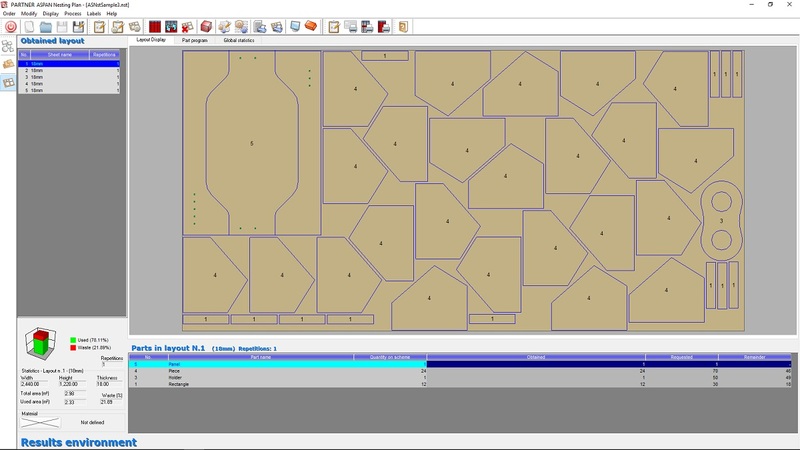 With APL users can create new CAD and CAM commands to optimize their design procedures. 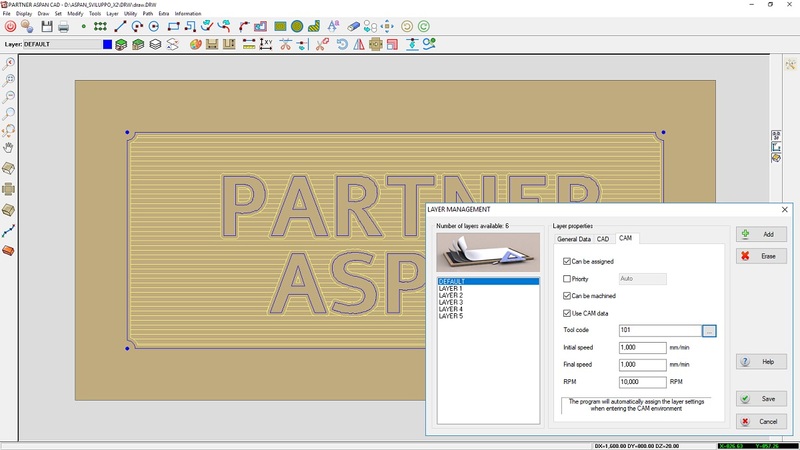 PARTNER/ASPAN can be linked to a variety of external programs such as “AutoCAD”, “IMOS”, “KDCw”, “Pattern System”, “Cabinet Ware” and “Drill Mate” by using ASC, an ATool Software proprietary format, and DXF files. 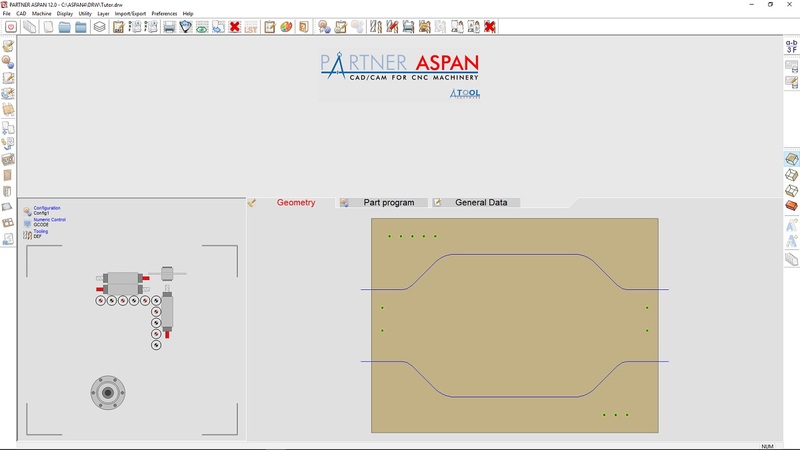 This means that users can prepare designs with their drawing program of choice and then use PARTNER/ASPAN functions to generate the machine programs necessary. Linking one program to another is made easy by a series of PARTNER/ASPAN utilities such as the possibility to “import CSV file”. 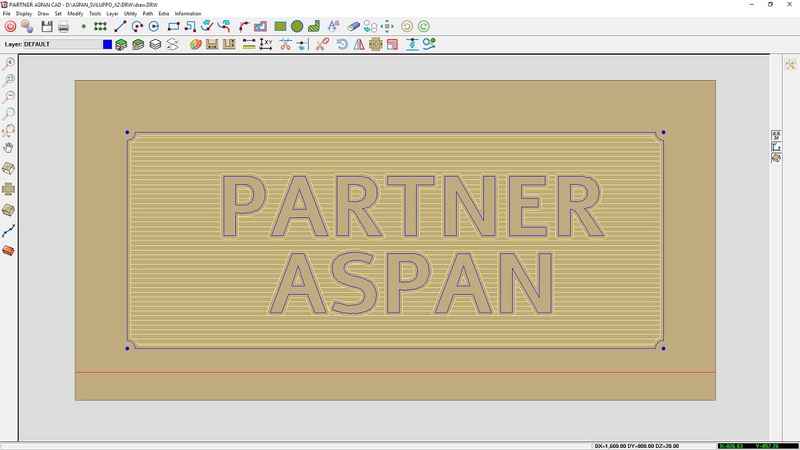 PARTNER/ASPAN can handle several machine types and allows the user to generate programs for multiple machines starting out from a single drawing. 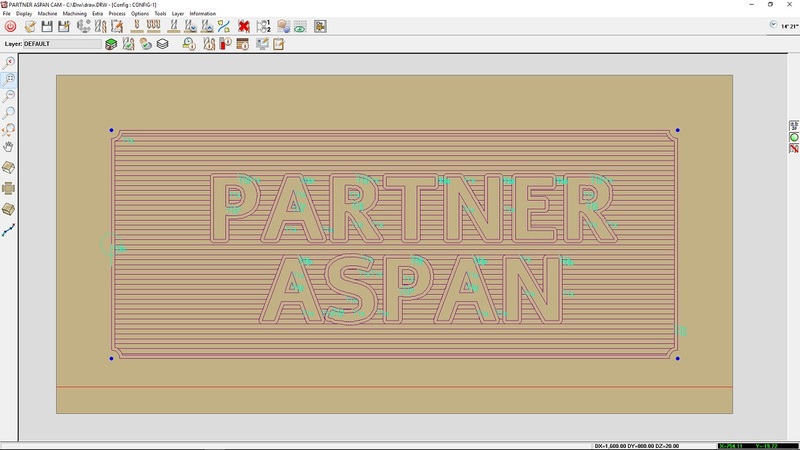 PARTNER-ASPAN can also reconstruct a drawing starting out from a machine program. This function can be used as a vital link between machines making it possible to pass data from one machine to another (“a connection bridge between different machines”). Machines from the world’s leading manufacturers such as Morbidelli, SCM, Biesse, Busellato, Anderson, CMS, Homag, Masterwood, Samec, CO.B.A.L.M., Cosmec and many others are supported by PARTNER/ASPAN. N.B. : In any case, please contact ATool Software by providing your machine model and type of CNC equipment used so that we can check your machine's support and assess your particular problems/case.